The National Capital Authority has approved the Works Applications for Capital Metro Stage One. NCA Chair Malcolm Snow said that the NCA had a responsibility "to ensure the highest standards of planning and development are adhered to. We must be satisfied that the urban design and landscape quality of the corridor is appropriate for Canberra's main approach, consistent with its national significance." This endorsement by the NCA enables contracts for construction to be signed between the ACT Government and the Canberra Metro consortium, and construction to commence. As our nations capital, Canberra has two planning approval authorities. ACTPLA are the local authority for most development applications, and the National Capital Authority are responsible for works approvals on National Capital land. 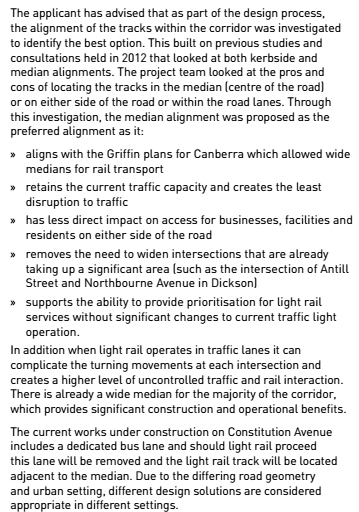 In addition, they have to approve works along approaches to Canberra in accordance with legislation governing the capital. Some of these covering regulations concern limiting building heights in some areas of Canberra (such as Civic, and along Northbourne) so that no building is higher than Parliament House. 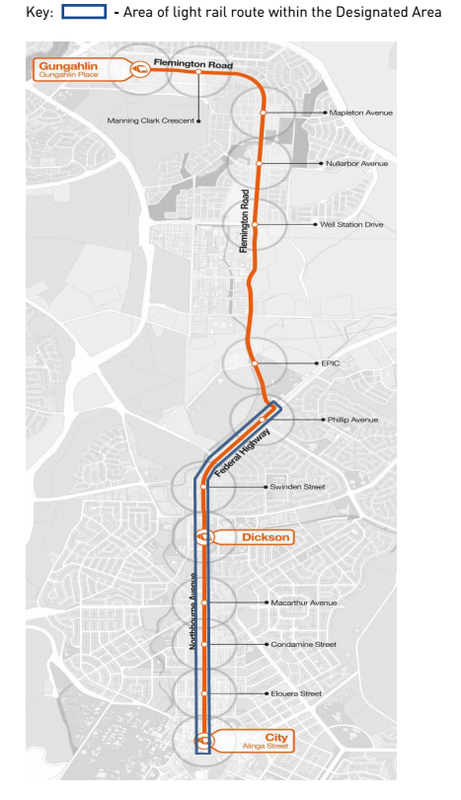 Capital Metro Stage One runs from Gungahlin to Civic, along Flemington Road, the Federal Highway and Northbourne Avenue. The Northbourne corridor component of the project was subject to works approval by the NCA. 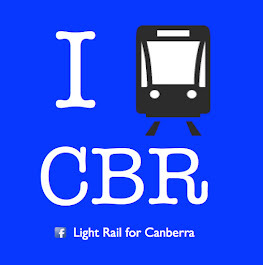 Now that Capital Metro Stage One has been endorsed by the NCA, contracts can be signed between the ACT Government and the Canberra Metro consortium, with preliminary works commencing in June before full construction proeeds in October. Separate works approvals will still be required for elements of the construction (including lighting, drainage and pedestrian and cycle paths north of Antill Street in Dickson). 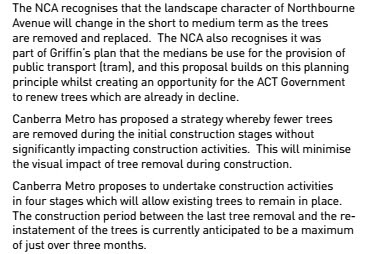 The NCA made a series of amendments to the submitted plans including removing a right hand turn from Northbourne Avenue to Rudd Street and signalising some intersections. It is worth reading the NCA report (available here). 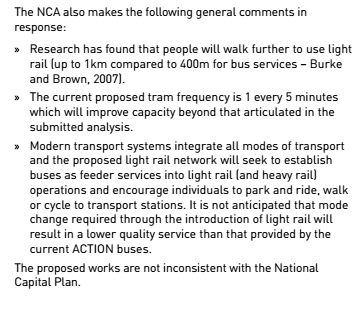 Many of the submissions object to light rail and those objections are addressed by the NCA. 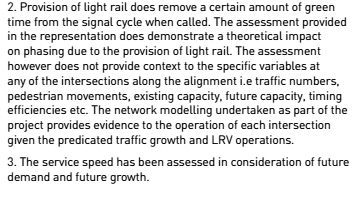 In particular the NCA notes that moving light rail to run on the road, instead of the median, is not consistent with the National Capital Plan. Some of the submissions are truly incomprehensible (Appendix F is ripper). It is worth reading the NCA report here. 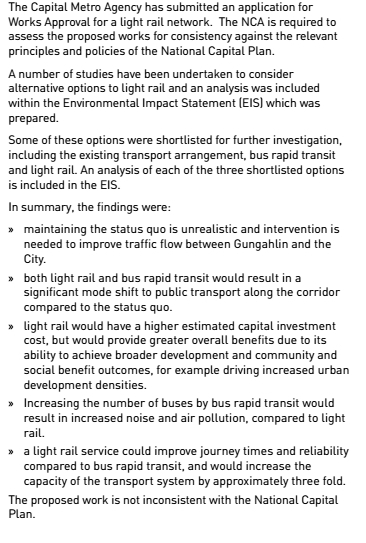 "The National Capital Authority said it had assessed "the proposition of a light rail system" in the corridor and found it consistent with the National Capital Plan and the Griffin legacy. "The proposal reinforces the main avenues by: realising Northbourne Avenue as a multi-use boulevard providing a corridor for public transport; preventing the Central National Area from being overwhelmed by through traffic and; providing a public transport system that reduces car dependency," it said. Mr Snow said the authority had a responsibility "to ensure the highest standards of planning and development are adhered to. We must be satisfied that the urban design and landscape quality of the corridor is appropriate for Canberra's main approach, consistent with its national significance." 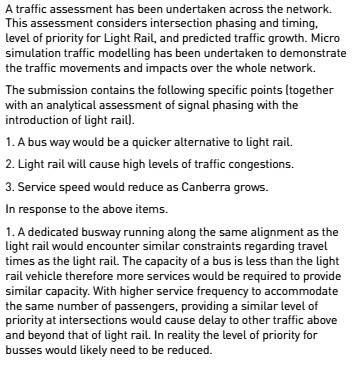 "The authority is required to assess the project against the National Capital Plan, and today, it found the light rail project was "not inconsistent" with the plan's principles and policies. The decision comes after an earlier approval from the Government's own Environment and Planning Directorate. Despite some elements still needing approval, the Government is hailing this as a major step forward for the project."